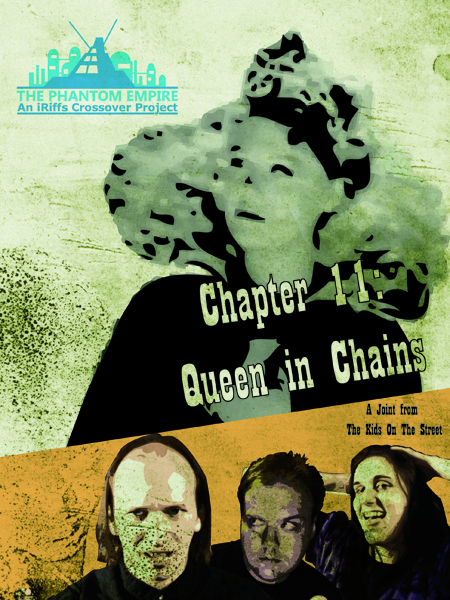 "The Phantom Empire, Chapter 11: Queen in Chains"
The potent combination of Gene Autry, giant robots, and a city beneath the surface of the Earth soon overtook the kids, and they found themselves gaping in awe at the majesty and grandeur of a cardboard vision of a world not their own. It wouldn't be long before they were all ready to declare Chapter 11 (a joke Charles made us promise not to use in this short). "Queen in Chains" presents explosions! Fisticuffs! And jaw-droppingly bad costuming choices galore! All lovingly hand-riffed by the Kids on the Streets' stalwart team of Glen, Charles, and Maria.